Christmas 2018 Bucket List/Advent Calendar — Victoria, Truthfully. Thanksgiving has come and gone and it is officially December, which means I get to say that as often as I like! The best time of the year is upon us and excitement is in the air. Can you feel it? I love the anticipation, joy, and wonder this season brings. I really think Christmas brings the best out of everyone, reminding us that slowing down, enjoying the moment, celebrating traditions, and spending time with those we love is what truly matters. This Christmas, I’ll be doing something a little different on the blog. Unlike the past two years, I am not going to be sticking to a strict, 25-day Blogmas schedule. Truthfully, I just don’t have the time this year and the time I do have, I want to spend enjoying the season, not hustling through it. 25 Days of Blogmas is no joke, and if there’s any indicator I should do something different, it’s my husband gently mentioning in November that perhaps I should consider taking this year off. I’m thankful for him - he looks ahead and looks out for me. I know this will be disappointing to some of you (I get it, I’m a little bummed too! ), but rest assured, you will still get lots of fun, festive content over the next month. It is after all, some of my favorite content to share! I’m hoping that in slowing down a bit on the blog, I might inspire you to do the same in your own life too. Savor every minute of this season. Do the things you love, not out of pressure but because you want to. If you don’t get to everything, that’s okay! No one’s grading you, and presence is what truly matters. This Christmas season might look different than last year or the treasured years of your childhood...but maybe that’s a good thing. Maybe the Lord has something new, something important for you this year that you are just now ready to receive. So friends, let’s keep our eyes and hearts open to whatever that is. 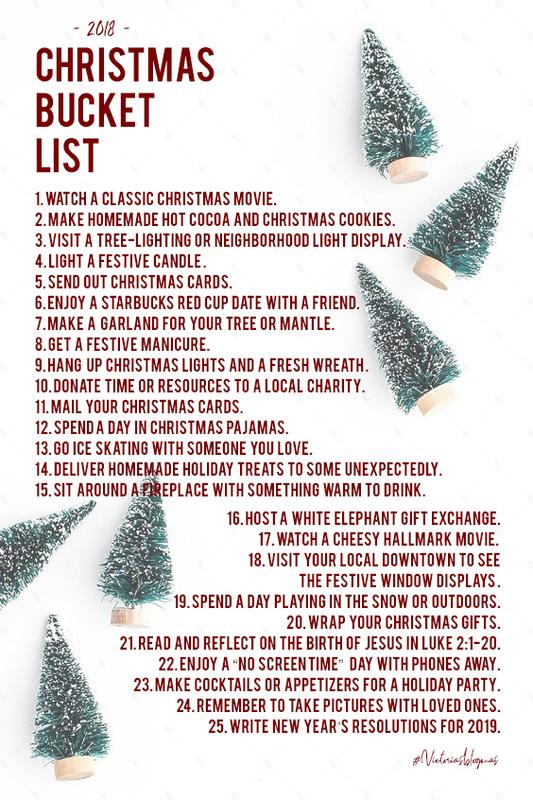 To celebrate the first day of this special season, I’m sharing with you my 2018 Christmas Bucket List. Again, this isn’t meant to put pressure or stress, but rather to add some intention and excitement to your days as we all anticipate the arrival of December 25th. Reed and I like coming up with these ideas together, then I whip up a little checklist and we hang it in our office. This year, we’ve come up with 25 ideas so you could do one each day as an advent calendar of sorts. Add, take away, use this as inspiration to make one more tailored to you - whatever works! Simply let today’s post and this bucket list fill you with excitement and delight as we step in together to the magical, hope-filled season of Christmas. If you want to follow along all month, simply click ‘Victoria’s Blogmas’ under the blog drop menu to find all Christmas posts at once, or find them as you scroll down the home page. Share in the comments if you decide to use this bucket list, and if you post about it on Instagram, tag me so I can see how you’re celebrating!